BelindaSelene: New by Benefit - Bathina "Soft To Touch...Hard To Get"
New by Benefit - Bathina "Soft To Touch...Hard To Get"
I recently received a nice little package from Benefit with this baby inside. They always have the cutest designs and packaging, their product development team know what they are doing. I find myself gravitate towards their counter at Sephora every visit. 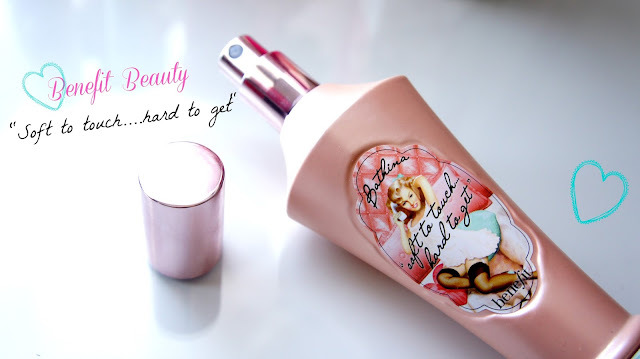 New to the Benefit beauty line is this new body oil which has a flirtatious scent to it. I took a nice hot shower then shaved my legs. I usually like to put on a very thick cream to my legs afterwards, but this time I reached for this body oil. The almond oil and vitamin e not only helped moisturize my skin but also gave them a glowing radiant shine. My legs looked flawless. I like the convenience of being able to spray it on and gently rub it in. The scent is very feminine and sophisticated. It can also be substituted as a massage oil. It's a very nice little luxury to have, not to mention how glamorous it looks on your vanity/counter, but I wouldn't substitute it for my daily body cream. It's a bit pricey and doesn't last as long as a thick cream would. With sitting and just walking about it wears off and you might have to moisturize after a couple of hours. I love the scent and the result of it gives my skin. It does not make you feel greasy like most body oils do. This makes a really nice gift for any Benebabe, a birthday girl, and especially for a bachelorette. You can find it at you nearest benefit counter this November. I can't wait to see the rest of their body products line. Benefit never disappoints. Ricardo and I just ordered a pizza. I guess I don't count calories on weekends. Oops. Yum! Can't wait to eat. Talk to you lovelies soon! The package is so cute! They always get me with their packaging lol! I love Benefit products. When the new fall line launches this will be one of the ideas I will look at trying out. I'm excited to see what else they will have. I'm never disappointed with them.